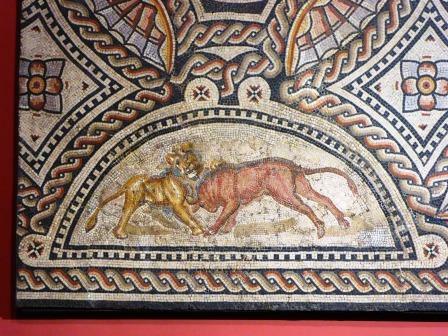 When I was thinking of visiting museums in the Germany, I was largely thinking of the military collections; arms and armour, elements of fortifications, inscriptions and pictorial military tombstones. Lovely stuff *rubs hands together*. 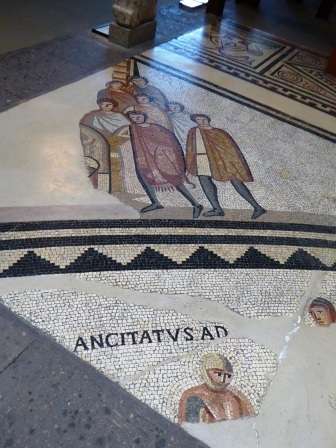 I wasn’t really thinking of mosaics. 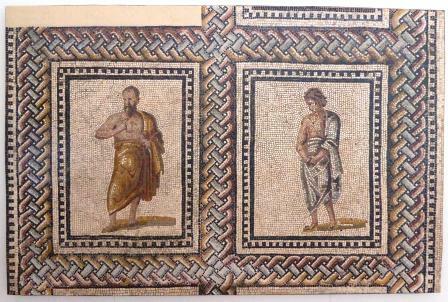 This is not to say that I was unaware of the presence of mosaics in these collections. It just wasn’t a key motivation. 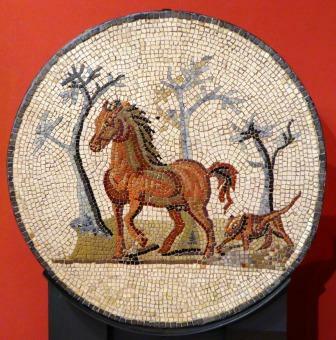 Now, having seen a few of the mosaics on display, I must say that I was impressed. 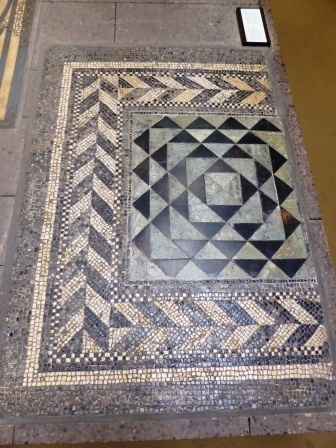 Mosaics don’t really seem to form major elements of the collections, they’re not the central focus, but what the museums do have is really worth a look, so I thought that I’d share a few from a couple of German museums here. I don’t have anything that could, laughingly, be called analysis for you. This is basically just eye-kandy. 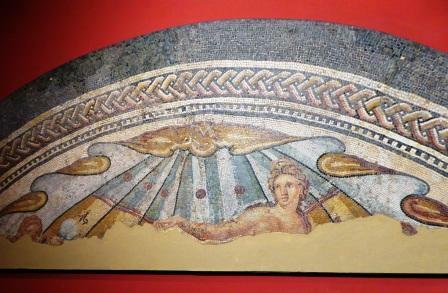 The ridiculously good Römisch-Germanisches Museum in Cologne is home to this stunner. Found during the building of a bomb shelter in 1941, this near-complete 750 sq.ft. 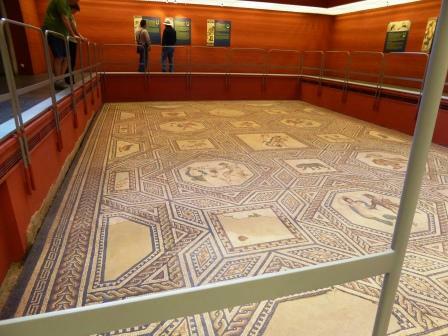 3rd century villa floor has been preserved in situ, with the museum subsequently constructed in the space around it. 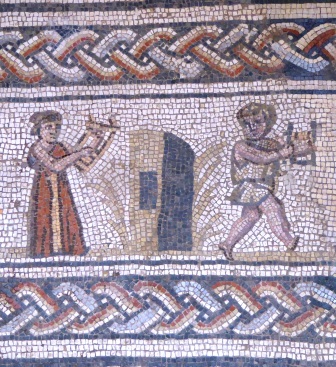 The mosaic shows Dionysiac scenes, with pipe-players, timpani, dancing, getting a bit jiggy, and lots of animals. 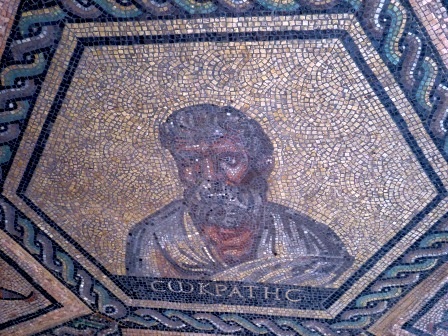 The other really large scale floor mosaic in the museum is this Philosophers mosaic. I understand that there was some restoration in the 19th century, and we all know what that means, but it’s a very nice example of the type. 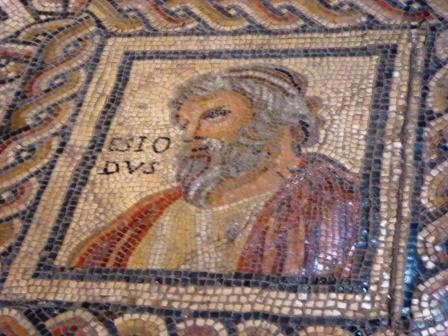 It’s a little bit tricky to get decent photos of the individual characters depicted, but here’s Socrates (CωKRATHC). 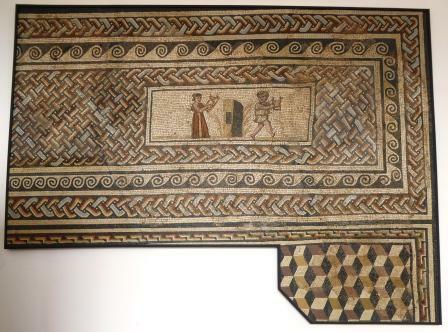 This fragment has a gladiatorial scene in the ribbon, with the audience (?) looking on from the corner. 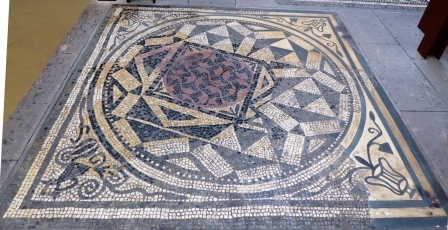 There are also several non-representational mosaics incorporating mosaic and opus sectile. 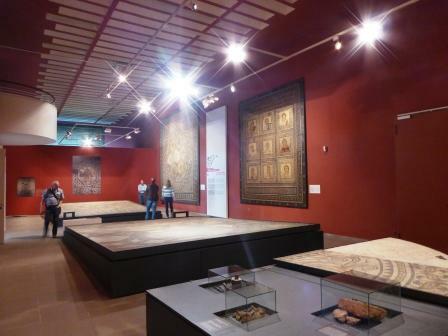 The other big museum that I visited was the Rheinisches Landesmuseum in Trier. I must confess that I found this museum a bit weird. 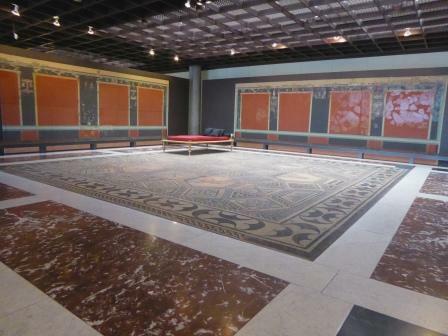 It’s not that obvious how to actually get into the main galleries as you have to go through the shop . 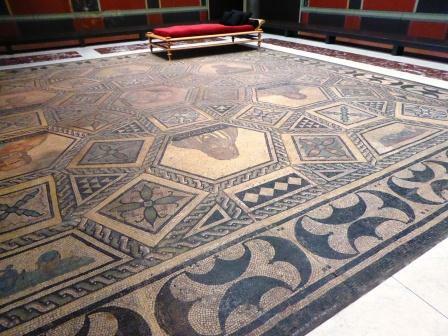 Some of the connections between galleries seem a bit…pokey, and there’s a huge…really huge, 18th century Romanesque monument stood in the corner of one of the Roman galleries. 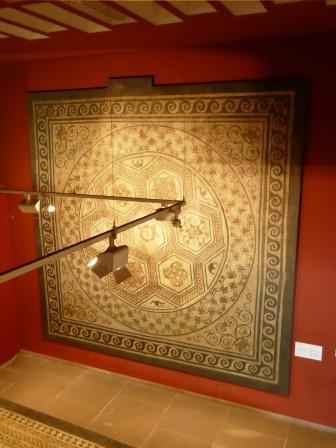 I get that they were trying to make the point about classical revival, but it’s literally the only revival object and it’s massive. Ho hum. 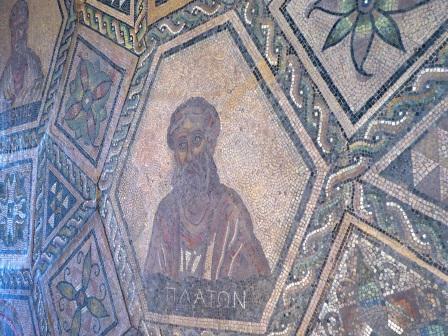 Anyway, there were some nice mosaics. 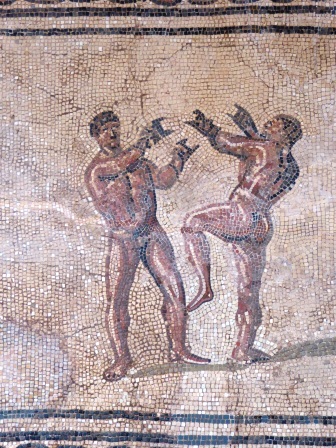 Some more philosophers. 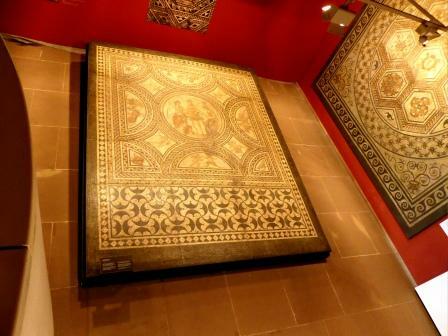 There is also a main mosaic gallery which can be viewed from a small balcony just off one of the upstairs galleries. It’s a weird space, weird enough to feel like it’s actually a temporary gallery (I don’t know if it is), and it has horrible lighting. 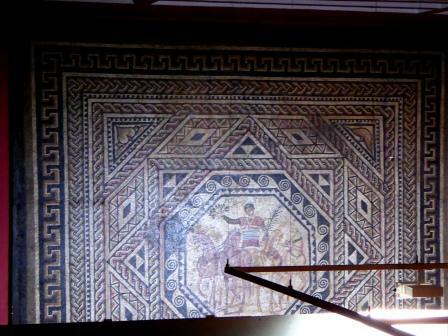 When viewed from the little balcony, you get these awful lighting tracks in the way of the mosaics on the walls. 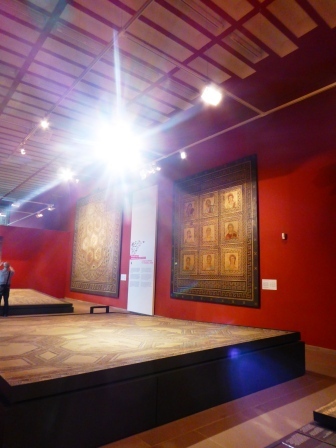 When you’re in the gallery, you’re blinded by hideous spotlights. 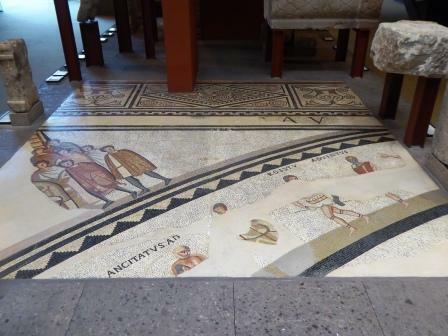 Which is a big shame, because there are some nice mosaics in there. 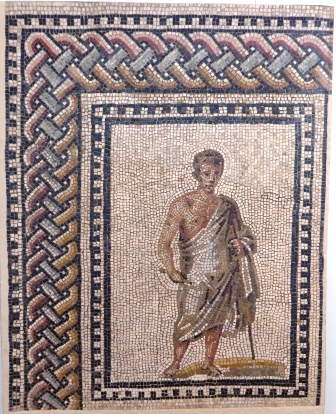 There is also the famous Charioteer mosaic. 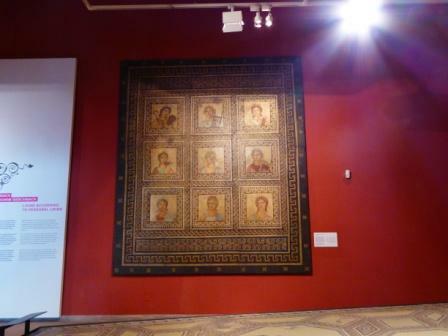 Unfortunately, it’s hidden behind a temporary wall at the moment. I don’t know why (conservation, perhaps). 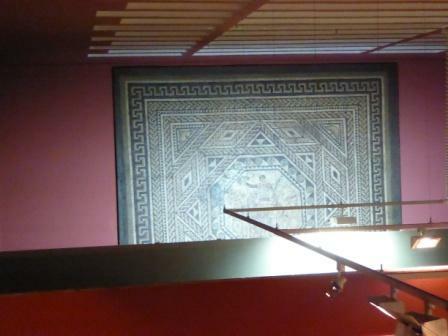 I only know that it’s there because I glimpsed it from the balcony (again with the hideous lighting tracks). 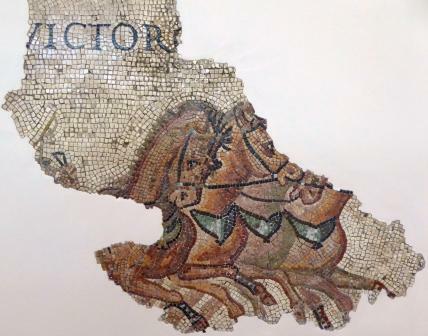 So anyway, I leave you with a more accessible, although less complete horse-racing scene. I think that it’s fantastic.